With the winter breeze, coming over to spread in the air and aura; everything is going to sing a gay song. But there's one this thing called, 'morning bath' that drags down the mood. Here is the solution. 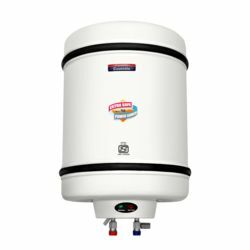 Padmini Electric Water Heater, would heat up the water warm, and you can enjoy the warm baths. This 25 litre of electric water heater, comes with a powder costed outer body. With the water heater like this, the running away from cold-water bath would vanish in moments!